I made these for a picnic. They were very delicious when they were freshly baked... Unfortunately, the marshmallows and chocolate toppings melted in the hot sun and lost its appeal to everyone. I had to discard the excess at the end of the picnic as they were too messy to keep. Apart from the fact that this cake is not very sunny-day-friendly, this cake is actually super easy to make and very delicious to eat. Sad that it wasn't much appreciated for this picnic. 1. In a large bowl, whisk together graham cracker crumbs, whole wheat flour, sugar, baking powder and salt. 2. Add eggs, milk, butter and vanilla to flour mixture and stir with a wooden spoon until blended. 3. Spread batter evenly in prepared pan. 4. Bake in preheat oven for 15 min. 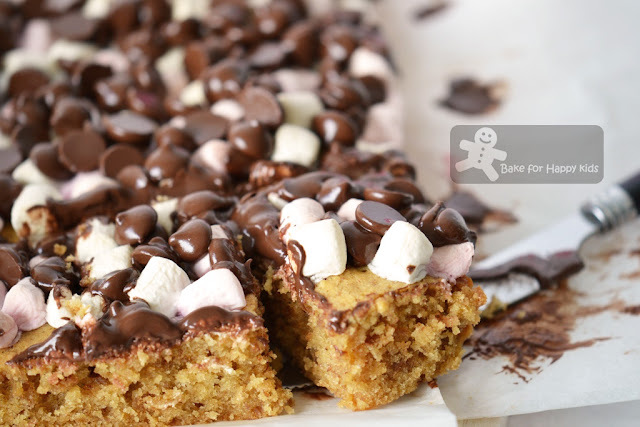 Sprinkle evenly with marshmallows.Bake for 8-13 min or until marshmallow puffed and golden and a toothpick inserted in the center of the cake comes out with a few moist crumbs attached. Immediately sprinkle with chocolate chips. Let cool in pan on a wire rack for 20 min. and serve warm, or let cool completely, serve at room temperature. Note: Using half the recipe, I made my cake with 15cm x 26cm loaf pan. I baked it for 20 min at 160°C fan forced st first, then I sprinkled the marshmallows and baked it again with the same temperature for another 15 min. When the cake was removed from the oven, I sprinkled the chocolate chips on top of the warm cake immediately and the chocolate chips melted onto the cake very beautifully. Yummy! I would have ate it all if I were there..I think it still looks yummy with the melted choc chips! Awww ... that's sad. They look really good tho! I would eaten it anyway. S'mores are meant to be gooey!! This looks delicious, definitely going to try it in the summertime! The cake looks delicious! I'll keep this in mind, that it melts real fast under hot sun! Especially with our hot weather here, I think best keep it refrigerated! But it does look really good! 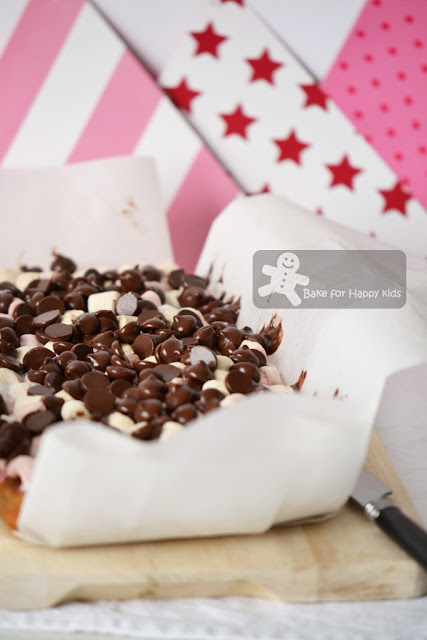 My kids love marshmallow, they will certainly love this! Hope you had a great time at the picnic! oh man..this looks dang rich and addictive. what a pity! but the cake here looks truly delicious especially with the topping. The weather in melbourne now must be terribly hot! This has such a delicious presentation-hard to resist a fluffy cake with these flavors. Those chips on top are calling to me.... This does look like a sweet addiction! Love the close up pictures. Great post. HI Zoe, the cake looks so delicious and I like the topping. Sad to hear balance of the cake went into the bin...but I think no doubt the topping melted, it should still taste equally good. Have a nice day. It is so beautiful!! !And sooo appealing:)))Kisses,dear! Wow wish i live near to u..incredible smores cake.. It looks so lovely here and am sure it was delicious. Shame about the sun.... not usually a problem in my part of the world...! It's a shame to throw it away! The cake looks so pretty! Much better than mine! wow! This look so delicious with the chocolate chips melting on top!! For me , it look delicious and even the look also ok for me. Oh, they look so beautiful freshly made. How sad that they were ruined in the sun! 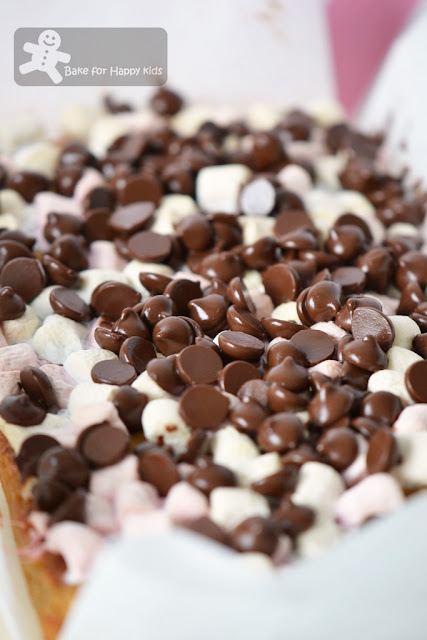 This looks delicious with the chocolate and marshmallows on top! Looks like a fun cake to make. They look pretty! Too bad they did not turn out well under the sun. oh.. my i am going to put on weight.. This looks delicious! What a bummer that it didn't hold up well at the picnic. I'm thinking this recipe would make absolutely adorable cupcakes as well. Wow! This cake looks amazing and something my kids would devour. It actually looks just like a s'more would with the chips all melted, so I think it's better that it melted, all gooey! We just made s'mores tonight with homemade graham crackers and used Ghirardelli dark chocolate caramels. We broiled them and they were simply divine.